Jude recaps Goosebumps 35: A Shocker on Shock Street by R. L. Stine. Werewolves! Monsters! Robots! Stine at his Stinest! Raven recaps Jessica and the Secret Star, in which he writes LIMERICKS. Everyone loves limericks, right? Jude recaps The Bailey School Kids 31: Ghouls Don’t Scoop Ice Cream by Debbie Dadey and Marcia Thornton Jones and my god, these kids are kind of terrible. 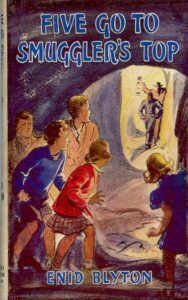 Wing recaps Famous Five 4: Five Go to Smuggler’s Top by Enid Blyton and spends far too much time bored considering the book is filled with smugglers, secret passages, and animal attacks. Dade recaps Nightmare Hall 12: The Whisperer by Diane Hoh and it is a tight, tense little thriller with one big flaw. Jude recaps Graveyard School 13: Tales Too Scary to Tell at Camp by Tom B. Stone. GHOSTS! MONSTERS! ALIENS! Creepy cabins inside creepy woods! Dove recaps Making Out #5: Claire Gets Caught by Katherine Applegate (and Michael Grant) wherein Claire is outstanding, Lucas is a horny toad, Jake is adorable, Nina and Benjamin are faffy, and there is SNOW!